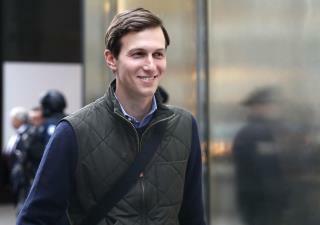 (Newser) – Donald Trump son-in-law Jared Kushner is expected to end up with an influential White House role, and pundit Mike Allen's new Axios newsletter says lawyers have figured out a way around nepotism rules that will result in a title as "senior adviser." The latest cover of New York magazine has a different title: "President In-Law." The story provides perhaps the most in-depth look so far at Ivanka Trump's 35-year-old husband, and it throws a bit of cold water on the notion that Kushner will act as a "force for moderation" on the new president's most controversial ideas. While Kushner has become one of Trump's most trusted advisers, "there’s little evidence that anyone can moderate Trump, other than Trump himself, and there is little doubt where Kushner’s ultimate loyalties lie," writes Andrew Rice. As Kushner himself has put it: "family first." Let's not forget that the Five Boroughs of New York voted 91% for Hillary Clinton & elected the foolish De Blasso their Mayor. What else would you expect from these self-grandstanding elitist?